This course is the first semester proseminar for the Wired MA in Historical and Cultural Visualization. The whole course is basically about the idea of data in the humanities, and about how “digital humanities” can become multimodal. We start out with some HTML and CSS, move on to archives and metadata, turn to basic data viz, and then get into historical GIS and digital mapping tools. We try to emphasize tools that are accessible for teaching as well as research, and methods that are reproducible on a budget. The best part of the class is when everyone fully appreciates how much of a critical and structural point of view is embedded in our “tools” and how inseparable those considerations are. This is a Bass Connections Information, Society, and Culture and Rubenstein Archives Alive course. 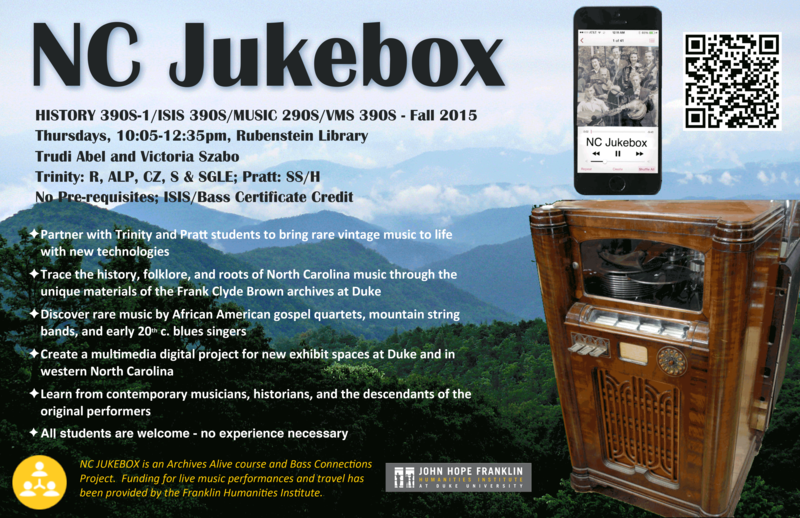 NC Jukebox is focused on taking the Frank Clyde Brown collection of 1930s songcatcher recordings from Western NC and making them available to the public. The course is about researching the singers and songs, thinking about how we construct cultural histories, how we create multimodal physical and virtual exhibitions and archives, and the ethics and legalities involved in all of it. We are developing a public online archive, a physical exhibit for the Rubenstein Library to open in Summer 2016, and another exhibit to set up in the Mountain Music Museum of Western NC. The project will continue as a group research effort in Spring 2016 and hopefully beyond.